These days, the collection of tab makers are growing and getting more advanced. But before the era of tab makers the method was manual writing, no I’m not thinking about quills. But computer writing and fonts. Now as I’ve mentioned before I rarely use tabs anymore, but I don’t think I would be able to learn the ocarina without them. I wouldn’t have the patience to both learn the instrument and learn to read sheet music when starting out. So I highly support the use of them. And it’s great for introducing the ocarina to new beginners. It only consist of the tabs above, but I have ideas about adding other symbols that are relevant in tabbing (input is appreciated). I also plan to expand my collection with time. Feel free to use them for non-commercial projects. Check out the page “Ocarina Fonts” for the download. Here’s a little tune that I made. It’s my first original melody. I’m still in the process of learning sheet music, so I’m not that good at writing music down. When I first jotted it down on a piece of paper it was a long line of notes without any form of structure like bars or rests, and it consisted of only half and quarter notes. After I had finished writing down a rough sketch, I opened up Musescore and wrote it in there. This time i tried to make it correct so that it would sound correct when played. It’s easier to find out if I’ve written it correctly when I can listen to it. It still sounds kind of rough, but at least it sounds more like I want it to sound than my sketch would have done. Here is a quick recording of it. 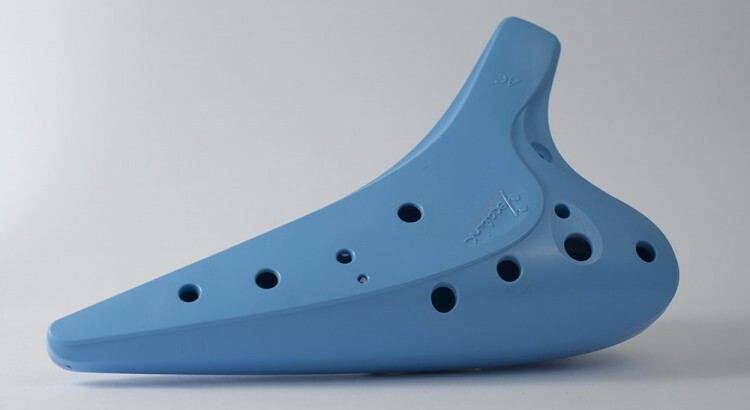 The ocarina is the first instrument that I learned to play. It’s a pretty easy instrument to learn. Take note though that learning and mastering is two different things. As I mentioned in the first post, I didn’t pratice much at first because I was shy and didn’t dare practice if I thought anyone could hear me, which is highly likely when you live in a dormitory with 20 people, and when you’re learning an instrument for the first time, it doesn’t sound that great. At least not at first, but with practice (as almost everything in life) it gets better. When I first started, I was using tabs. It uses pictures of the ocarina to show which holes to cover for each note. I think this is a great way to start because you can focus on playing the notes clearly instead of having to focus on which note to play. At least for me, who at the time didn’t know how to read sheet music. After playing for a while I learned how to play each note in my ocarina’s range from the sheet music. And I started using sheet music, which I still do (along with learning by ear). But I still have a long way to go on the learning side. But as an old saying states. One learns as long as one lives. I would recommend learning sheet music because it is more universal. Tabs isn’t just limited by the fact that it is made for ocarinas but there is also different tabs for different kind of ocarinas. For example: 6 hole or 12 hole. So have a better chance of finding sheet music for a song. But in the end, at least for me, the joy of ocarinas comes from playing them and for that matter the type of notation used is unimportant. In this first post, I think it would be appropriate to tell you how my passion for ocarinas started. I’m not one of those that got obsessed with having an “Ocarina of Time” replica after playing Zelda. Actually I never owned the game myself, though I did know of it. My journey into the world of ocarinas, started in the fall of 2010. I’ve always wanted to play an instrument but I’ve never gotten around to learning to play one. My previous experience was with recorders in elementary school (can’t say I remember any of it), and then we had one guitar lesson. My guitar had a hole in it, on the backside. But the thought of “I wish I could play the…” has been there for as long as I can remember. After my wish to learn to play an instrument got rekindled, I searched online for various instruments. Looking for what was about to be my first instrument. I really liked the game music from Zelda and I had recently played “Ocarina of Time” for the first time in my life. So, on one of my searches I typed in ocarina and that eventually brought me to the forum theocarinanetwork.com. Which I was checking regularly before joining on October 27th. Though I would still remain “quiet” on the forums for a while. Still I had found a source of more information about the ocarina and I was enjoying reading and learning more about this little woodwind. But I didn’t actually own one yet. But I was working on it. 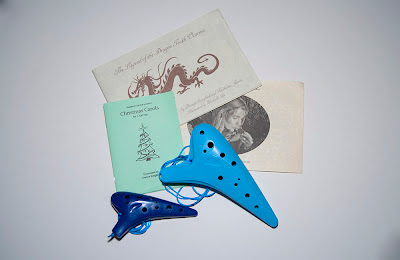 After researching where to buy them and giving much thought to what would be a good ocarina to start out with, I had finally made up my mind and a package from songbirdocarina.com was on it’s way. After a short while, my first ocarinas was in my hands. Along with some tab books. Turned out that the Christmas Carols book was for pendants. Well, well. I went for plastic because they were cheaper and practically indestructable. The brand is Focalink. I now had my ocarina “start-kit”. Though I didn’t practice much at the start. Being shy and living in a dormitory with several experienced instrument players, I only practiced when I was home for the weekend or holidays. And so was the beginning of my journey into playing the ocarina. I had found a hobby I much enjoy.